This article firss appeared in the Vancouver Sun, January 5th 2014. By Larry Pynn. Construction of the Okanagan Connector in the late-1980s opened pyrite-bearing rocks to water and air, creating the flow of acidic, metal-laced leachate into the upper waters of the Pennask Creek system, the top source of trout for stocking lakes in B.C. Dignitaries described the $225-million Okanagan Connector, Highway 97C, as an important new conduit for commercial and industrial activity when it officially opened in 1990. What they didn’t say — or knew — is that for decades to come the highway would become the source of an acidic stew of toxic metals emptying into the headwaters of Pennask Creek, described as the world’s greatest spawning site for wild rainbow trout. It is so rich that one million eggs are taken from trout in the creek each spring and reared in hatcheries, then used to stock some 110 lakes around the province — more than any other single source. The province has already spent millions to reduce the environmental impact — helping to ensure a healthy spawn downstream of 25,000 trout this year — but acknowledges that current remediation is falling short and more needs to be done. “(Pennask Creek is) the cornerstone of the B.C. 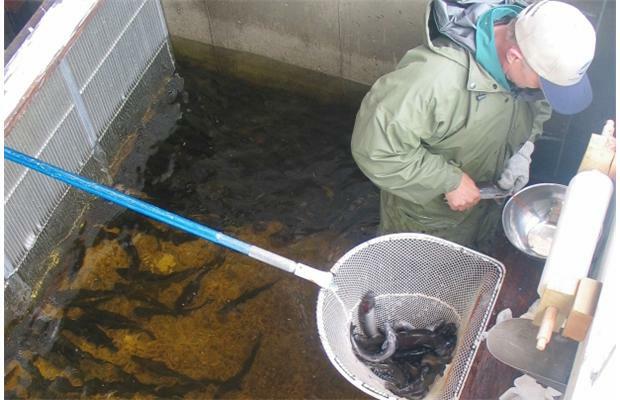 lake-stocking program,” confirmed Tim Yesaki, vice-president of operations with the Freshwater Fisheries Society of B.C., which collects the Pennask trout eggs for restocking lakes across B.C. When construction crews began to build the Okanagan Connector, they unwittingly exposed pyrite-bearing rocks near Pennask Summit to air and water, thereby triggering the process of acid-rock drainage, or ARD. ARD poses a threat to fish and aquatic life through acidification of the water and elevated concentrations of sulphate and metals such as iron, zinc, cadmium, copper, and aluminum. The problem is more commonly associated with mine sites. The best-known local example is Britannia copper mine, a national historic site on the Sea to Sky Highway where a $27-million treatment plant officially opened in 2006. Under a public-private partnership, EPCOR Water Treatment Services built the plant and last year received $720,000 in operating costs from the province. It has been so successful that pink salmon now spawn there. The B.C. government told The Vancouver Sun it is aware of water-treatment systems installed, or about to be installed, at 13 other mine sites (all but two closed) across the province. The costs of these operations are borne by the mining companies. At least one other continues to pollute the environment with no treatment facility at all. Acid rock drainage on the Okanagan Connector could not have occurred at a worse site — draining into so-called Highway Creek, a tributary of Pennask Creek, which flows into Pennask Lake. The site is about midway between Merritt and Peachland. Although remarkable for its productivity, the Pennask watershed is not widely known to the public. Public access to Pennask Lake is difficult, via a rough, four-wheel-drive road to a 244-hectare provincial park at the southeast corner of the lake. The rest of the shoreline is privately owned. The province has discovered that polluting a creek with those sorts of credentials doesn’t come cheap. In 2005, the Ministry of Transportation pleaded guilty to two federal Fisheries Act counts of depositing a deleterious substance into Pennask Creek. Elevated levels of aluminum, copper and zinc were found. The province was fined $1,000 and ordered to pay $45,000 to the Environmental Damages Fund for use in creek rehabilitation. In response, the province installed a treatment system consisting of two acid-mine drainage machines to raise pH levels (neutralizing acid levels) and remove metals, constructed lined channels and reservoirs to capture water and then treat it with lime, and drilled monitoring wells to provide water-quality information. To date, the government has spent $4 million on mitigation measures, with more to come. Transportation ministry spokeswoman Kate Trotter said the province has just hired Golder Associates on a $150,000 contract to offer expertise in acid-rock drainage and metal leachate and to develop a more permanent plan for the site. The ministry continues to “research long-term solution options,” appreciating it can take a “very long time” for acid rain drainage to naturally diminish and that “we are committed to long-term maintenance of the site,” Trotter said. It also observed that the settlement pond provides “insufficient residence time” to separate precipitates from treated water during the freshet, and there is no redundancy to allow maintenance and repairs when the system experienced problems. The dumping of inadequately treated sludge could also lead to a second source of acid rock drainage on Quilchena Creek. It recommended a phased, multi-year approach to remediation starting with a monitoring program, noting that location, chemistry and flow rates of contaminants will dictate treatment processes. Despite serious ongoing concerns, the creek had an excellent spawn of upwards of 25,000 trout this past spring, suggesting that acid rock drainage in the headwaters — so far, at least — has not compromised the overall productivity of the run farther downstream. That is not the only curiosity about this fish. While the trout remain small — half to three-quarters of a pound due to the low productivity of Pennask Lake itself — once transplanted to a productive lake “they can grow to incredibly large sizes, five to seven pounds or bigger,” said Yesaki. The key is the vast spawning habitat on Pennask Creek and the absence of other fish to compete with the trout. A 2010 master’s thesis by civil engineering student Lisa Walls of the University of B.C. concluded that while metal concentrations in the water and sediments “decreased markedly” since 2004 due to remediation efforts, concentration remains higher than elsewhere in the watershed. Monitoring of invertebrates in the stream bottom over a decade found “low abundance and diversity, and a complete absence of sensitive taxa at downstream sites” and the “likelihood of adverse biological effects for aquatic organisms, including rainbow trout, due to metal contamination in the watershed,” Walls concluded. 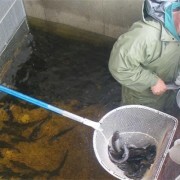 Trotter said the ministry “recognizes the importance of the downstream fishery” but noted that monitoring for invertebrates at two Pennask Creek sites furthest downstream of Highway Creek and within the rainbow trout spawning area “showed no impact on abundance, species richness … and composition” compared with a sample site upstream of Highway 97C. A 2007 geotechnical case study by Kevin Morin and Nora Hutt on Pennask Creek found that a substantial amount of surface and subsurface work had been done on water, soil, and rock around the rock cuts on the Okanagan Connector. There were no reports of acidic pH, acid-rock drainage, sulphide minerals, or metal coatings and stains. However, the rock cuts were not drilled or cored in advance, and there were no specific tests for acid rock drainage. Loretta Li, a professor in the department of civil engineering at the University of B.C., noted that B.C.’s Contaminated Sites Regulation did not take effect until 1997 and that the old ways of highway construction were based on economic sense and taking the nearest rock.